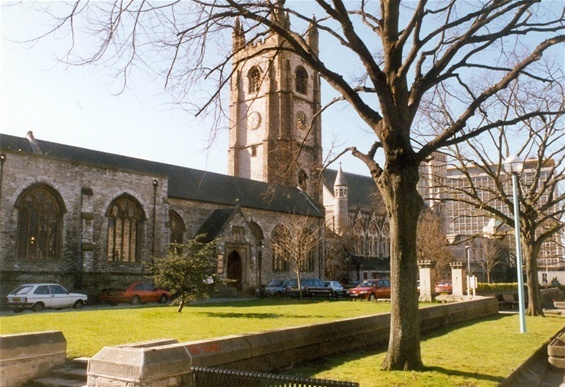 St Andrew's, Plymouth which has seen many baptisms, marriages and funerals of the Yonge's over the years. The Yonge's of Puslinch in the parish of Newton Ferrers Devon, near Plymouth, England is the family this website covers. The family had become established at Puslinch where James Yonge 1679-1745 married Mary Upton the last survivor of the Upton's of Puslinch. This marriage was a symbol of and the cause of the family's rise to the world of English gentry. This James Yonge was the son of Dr James Yonge a noted Plymouth surgeon and doctor of his day who wrote a fascinating journal about his life which was published some 60 years ago. Members of the family still live in the area and the Puslinch branch is treated as the senior branch of the family now although the family is spread all over the English speaking world in The United States, Canada, Australia and New Zealand. The earliest member of the family who can be identified with certainty is John Yonge who was born early in the 17th century and who married Joanna Blackaller from a local Dartmouth family, in Dartmouth in 1640. 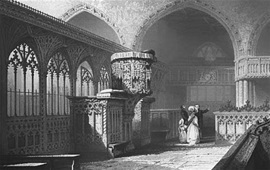 The picure above shows the inside of the church which is little changed from that period. It is probable that the family prior to then had been of humble origins and so will be impossible to trace back further. They may have been part of the Protestant ascendancy in Cork. Where the family came from is the great quest of my continuing research. 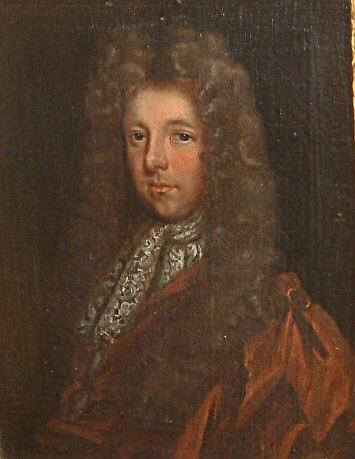 Two biographies of Charlotte Yonge refer to a family tradition that a Yonge left Norfolk for the more remote West Country to avoid paying for a knighthood being forced on him by James 1st. There is however no evidence to support this. Another original source material for information on the Yonge's in the 19th century, is the biography of the Victorian writer Charlotte Yonge, by Christabel Coleridge. This work also contains Charlotte Yonge's autobiography of her early life with its many references to other family members. Not always accurate though. Though marriage the family became connected with many West Country families such as the Fortescue, Upton, Mudge, Colborne and Duke which last is still a popular Christian name in the family. YONGE is simply one of the old English spellings of the adjective "young". The details are not clear but it seems that in the 17th century a family row concerning religion led to one branch of the family adopting the spelling "Young" or depending which version you believe one branch adopting the selling "Yonge". Some of the "Youngs" became noted naval oficers in the greata age of sail. One in the late 18th century received £40,000 prize money from the capture of a Spanish treasure ship. The family have never been rich or famous, with some exceptions, but is typical of many country gentry families, living a comfitable life and sending their sone into the professions and the sfour corners of the Empire and marrying their daughters into similarly placed local gentry families. Over many years through research at the National Archives in Kew, The British library, the Society of Genealogists and many county record officers especially those for Plymouth and Devon, I have amassed a large volume of document , photographs and other records. Large in names and room it takes up, a family tree has been compiled With that are brief biographical notes of many of the family members over the years for family history should be more than just a list of names. Each individual lives in their own time and their lives are a reflection of those times and in turn influence those times. A separate item on this web site gives details of just some of the family members over the centuries. 1) Of Caynton Manor Egmond near Newport Shropshire. 2) Of Charnes Hall Staffordshire. 3) Of Sturminster Newton Abbot Dorset known to go back to the 1530`s. The coat of arms is very similar to the Puslinch Yonge's but this may just be a case of copying. 4) Of Colyton, Devon. The first reference is in the mid 14th century when the family were well established Bristol merchants. Then they moved to London and Basildon in Berkshire, then to Sidbury in Devon and shortly after that to the neighbouring town of Colyton in Devon. Several published works (including Burkes Landed gentry) and derivative internet sources state that the Puslinch Yonge's and the Colyton Yonge's are connected. This is a fallacy. 5) The American Yonge's of the 18th century south and Florida are not connected. Over the past 400 years this family has seen and participated in many historical events and social changes. This continuing saga has now passed to the current generation . If you have any information, original documents or photos which will add to the story of this family, I would love to hear from you. In return if you have any family history problems where you feel I might be able to help, I should be only too happy to help. I am researching the life of the Rev James Carne, DD, and have found James Yonge MD of Plymouth as one witness to JC's Will in 1830. Can share more. Do you have any info about the family's time at Basildon Park? I volunteer at Basildon Park and am trying to build a picture of the early days of the estate. Could be interested. Who is it from and what price did you have in mind? To whom it may be of interest. I have a letter dated 1667 which I am about to put up for sale, relating to land owned by John Young / Yonge of Plymouth. I hope to be in touch before too long but at present wish to be incommunicado due to difficulty in finding time to achieve fulfilment of present commitments.